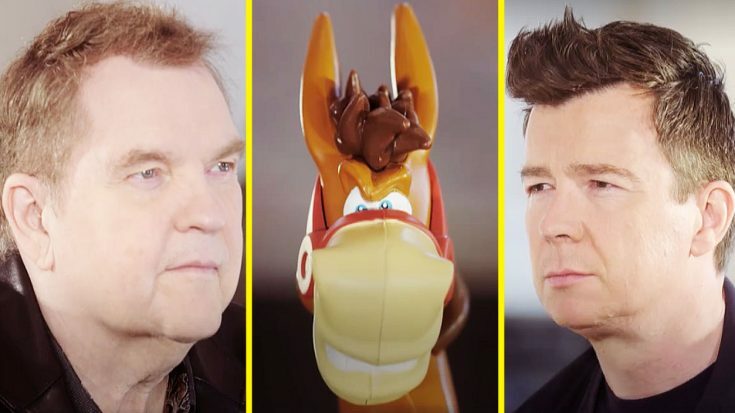 See Meat Loaf Go Face-To-Face With Rick Astley In The Fiercest Game Of ‘Buckaroo’ Ever! It’s A Battle For The Ages! In support of Stand Up To Cancer, Grammy award winning recording artist Meat Loaf and multi-platinum recording artist Rick Astley faced off in arguably the most intense game of ‘Bukaroo’ that you’d ever see! ‘Buckaroo’ is a game that begins with a plastic, spring-loaded horse named ‘Roo’. The objective of the game is to load as many items onto Roo’s back as possible without making it buck. The playing that makes the horse buck loses, and the other player is the winner. The game makes for an intense face-off between ANY two challengers, especially two legends like Meat Loaf & Rick Astley. In all seriousness though, it’s always heartwarming to see people come together and engage in friendly competition for good of a charitable cause like Stand Up To Cancer. This is one of many reasons why we love both Meat Loaf and Rick Astley. Check out their epic duel! Rick Astley and Meatloaf play Buckaroo.